After all that rich festive food, revive your tastebuds with a spicy curry. Serve this hearty recipe on a bed of steamed rice to soak up the wonderful juices. Cut the chicken into 2cm chunks. Heat the oil in a large pan, add the chicken and fry for about 5 minutes, stirring occasionally, until lightly coloured. Pour in the sauce, then half-fill the jar with cold water and add to the pan. Bring to the boil, cover and simmer for 5 minutes, then stir in the chick peas and vegetables and return to the boil. Cover again and simmer for a further 12-15 minutes until the chicken is thoroughly cooked, when the juices run clear and there is no pink meat, and the vegetables are tender. 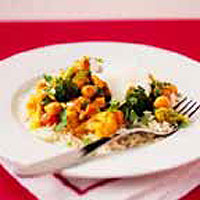 Sprinkle with coriander and serve on a bed of steamed rice with the yogurt spooned over. This is a great recipe for using up leftover turkey. Simmer the sauce until the vegetables are tender, then add diced turkey and heat through until piping hot.